this board won't let me attach a word.doc either. Here it is as a .txt. If you're still having the copy/paste problem in future, click the little toggle button right at the left corner of this editor box. When you right-click it, you will be able to see the copy/paste function menu. Now time for some housekeeping. From the list, select your OS and Platform (32-bit or 64-bit). 64-bit OS users, should read: Which Java download should I choose for my 64-bit Windows operating system? Go to > Control Panel, double-click on Add/Remove Programs or Programs and Features in Vista/Windows 7/8 and remove all older versions of Java. Then from your desktop double-click on jre-7u45-windows-i586.exe (or jre-7u45-windows-x64.exe for 64-bit) to install the newest version. If using Windows 7/8 or Vista and the installer refuses to launch due to insufficient user permissions, then Run As Administrator. If offered any unwanted software or toolbars during installation, just uncheck the box before continuing unless you want it. The McAfee Security Scan Plus may be installed unless you uncheck the McAfee installation box when updating Java. -- Java is updated frequently. If you want to be automatically notified of future updates, just turn on the Java Automatic Update feature and you will not have to remember to update when Java releases a new version. Now copy/paste the code into the runbox and click OK. Note the space between the ..X and the /U, it needs to be there. Thank you for your patience, and performing all of the procedures requested. I would also like to take this opportunity to apologize for any delay that may have occurred. It is very important that you get all of the critical updates for your Operating System and Internet Explorer. Keeping your OS and browser up to date will help make you less susceptible to attacks by Trojans and viruses. Please go to Microsoft and download all the critical updates to help prevent possible re-infection. Strong passwords: How to create and use them and consider a password keeper, to keep all your passwords safe. Download Host.zip and Save it to your Desktop. Right-click hosts.zip and select 'Extract all files' or 'Extract files...'. Follow the prompts and click 'Finish'. Double-click on the included mvps.bat file, this will rename the existing HOSTS file to HOSTS.MVP, then it will copy the included updated HOSTS file to the correct location on your machine. Once updated you should see another prompt that the task was completed. Follow this list and keep your antivirus program and antispyware programs updated and scan with them on a regular basis. By doing so, your potential for being infected again will reduce dramatically. Do you have any questions or problems to ask? Please do not hesitate to do so. **Please respond this one more time to ensure it is resolved and close this topic. All the delays were mine, plus that weird 16 hour difference thing. Are we going to do something on those 7 things that Eset tagged? I'll do the Java thing tomorrow. Thanks. These will be taken care of, with the use of ComboFix /uninstall switch. This will be cleared when you remove the existing version of Java. Ok, we will remove them. Please double-click OTM to run it. (Note: If you are running on Vista/7, right-click on the file and choose Run As Administrator). No worries. Enjoy your holiday with your family. 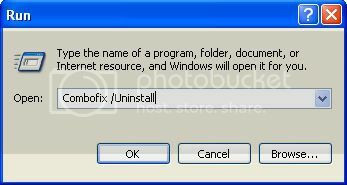 Java updated, combofix uninstalled. OTM hung up, and I can locate the OTM folders but no .log file. Mipony is still in the Start Menu. Edited by RandalSon, 28 December 2013 - 10:08 AM. Delete the shortcut in the start menu if the folder is not existed anymore. Did not seem to be there, and shortcut deleted. There are the additional protections in your post #48. anything else? I still have to replace the firstrowsports streaming app. Otherwise, it seems clean and it is a lot quicker. Three times today the connection through my router to the internet quit working. that is new. Twice a computer restart reconnected, the other one I had to reboot the modem and router. I do have two teenagers with phones running through the Wi-Fi, that is new. The Wi-Fi on the phones, do they quit working too?